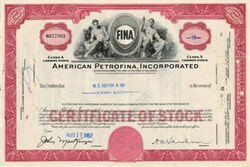 Beautifully engraved certificate from the American Petrofina, Incorporated issued in 1967. This historic document was printed by American Bank Note Company and has an ornate border around it with a vignette of two allegorical men flanking the company's logo. This item has the printed signatures of the Company's President and Secretary and is over 38 years old. 1956 American Petrofina, Inc. began operations with the $10 million investment of Petrofina S.A., headquartered in Brussels, Belgium. The first U.S. acquisition was Panhandle Oil Company in Wichita Falls, Texas with many acquisitions in the crude oil and natural gas exploration/production and refining/marketing arenas through the following years. 1963 The Company enters the chemicals business with the acquisition of Cosden Petroleum Corporation in Big Spring, Texas. Additional assets included the Big Spring refinery, terminals, production, pipeline and marketing outlets. 1967 Joint venture with Borg-Warner CosMar Styrene Monomer Plant in Carville, Louisiana. 1968 Acquisition of Gulf Oil Company's Calumet City, Illinois facilities to build Polystyrene Plant. 1973 Acquisition of the Port Arthur Refinery from BP Oil Corporation, along with BP's marketing and terminal assets in the southeastern US. 1977 Acquisition of Polystyrene Plants in Orange, California and Windsor, New Jersey. 1984 Acquisition of ARCO's Polypropylene Plant in La Porte, Texas. 1985 Changed the name of American Petrofina Company of Texas, a wholly owned subsidiary of American Petrofina, Inc., to Fina Oil and Chemical Company. 1991 Changed the name of American Petrofina, Inc. to FINA, Inc.
1992 Acquisition from Hoechst Celanese Corporation of a high-density polyethylene (HDPE) business and associated assets in the Bayport Industrial District of Pasadena, Texas. 1995 La Porte Plant expansion, Train 8, created the largest single-site polypropylene plant in the world. 1996 Carville Polystyrene Plant expansion created largest single site polystyrene plant in the world. 1997 Joint venture with BASF to build world's largest naphtha steam cracker facility, further integrating Company�s Downstream and Petrochemicals divisions. 1998 Expansions at La Porte Plant, Train 9, increased annual production to 2.15 billion pounds per year. 1998 Expansions at Bayport High Density Polyethylene Plant, Bay 2, doubled capacity to 850 million pounds per year. 1998 Merger of Petrofina S.A. and FINA, Inc.
1999 Total, S.A. acquires Petrofina, S.A., forming TotalFina. 2000 TotalFina acquires Elf Acquitaine, creating the fourth largest petroleum company in the world. The worldwide chemicals division is named ATOFINA, hence changing our company name to ATOFINA Petrochemicals, Inc. In the summer of 2000, the North American Headquarters relocates to Houston, Texas. Sale of Southwestern Business Unit, Southeastern Business Unit Marketing, including the Big Spring Refinery and several pipelines, six product terminals and various service stations and marketing assets. 2001 Start up of BASF FINA Petrochemicals Limited Partnership�s Naphtha Steam Cracker, world's largest steam cracker. Line 5 opened in Carville, Louisiana, increasing capacity to 1.7 billion pounds per year of polystyrene. 2003 May 6, the General Assembly of TotalFinaElf voted to change the name of the parent company to Total S.A.
2004 October 1, ATOFINA Petrochemicals, Inc. changed its name to Total Petrochemicals USA, Inc.